Even before I could google ~ my mind hit one and my search too led me to Dhiraj Parsana who debuted at Madras .. can you tell the other debutant in that Pongal Test ?? 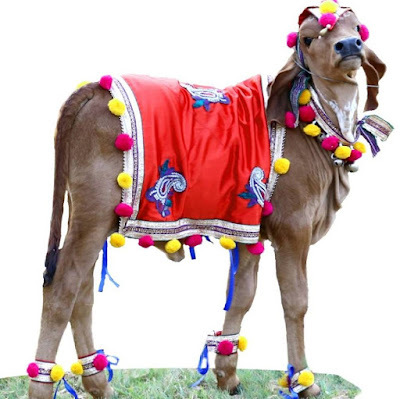 This post is on ‘Vijay Parsana’ , an Ahmedabad-based businessman who runs a chain of fitness centres, and is a cow-rakshak. Having 3 decades of experience in fitness and health training, a black belt in karate, carrying strong values from his rural background, full of passion and dedication, committed to social welfare, a firm believer in the natural system of living, a pioneer and visionary entrepreneur and an inspiration for fitness freaks, Mr. Vijay Parsana holds the beacon of progress and leads Parsana Fitness Centers and Parsana Wellness relentlessly, says their website. The cow protection, a religious movement is often negatively portrayed by media. Cows are holy and the opposition to slaughter of animals including cows has extensive and ancient roots in Indian history. The movement against killing of cow became popular in the 1880s; Arya Samaj founder Swami Dayananda Saraswati propagated it and Mahatma Gandhi too upheld it. This post is all about the Gau-rakshak in Gujarat and the post that has appeared in Daily Mail UK this day. ~ A husband and father-of-two in India has abandoned his family to live full-time with his cows, who he thanks for saving his life, starts this article. 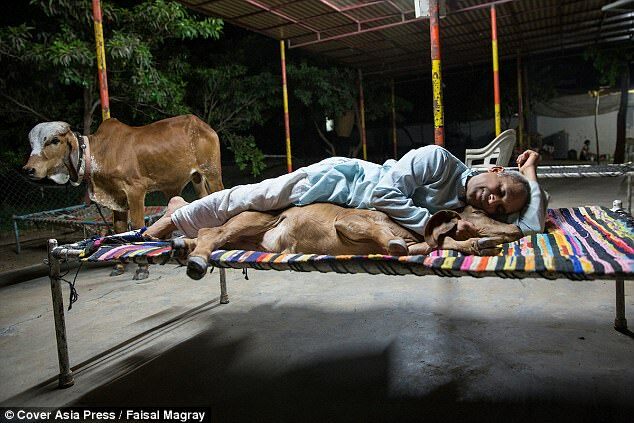 Vijay Parsana, 44, is so obsessed with his cows he bathes, eats, watches television and shares his bed with them. The father of two left his family five years back and started living in a religious retreat, about four miles away from his home in Ahmedabad, in Gujarat, India, to spend time with his cows. Earlier this year he spent £20,000 on a wedding for two of his herd, and unbelievably his family appear to be fully behind his new life. Vijay adopted the culture of loving animals from his parents and grandparents who owned several cows and dogs in their house. Vijay is so obsessed with cows that he baths, eats, plays, roams and shares his bed with them. Vijay’s wife, Geeta Parsana, 44, and other family members, friends and relatives fully support him in this affliction. He added: ‘I now balance my time between family, work and my cows. Now to give a Cricket touch, his name sake ‘Dhiraj Devshibhai Parsana’ a left arm spinner made his debut in that Pongal Test in 1979 against Kalicharan’s West Indies. Have seen Parsana earlier at Marina ground in Buchi Babu. India won that Test and he had a solitary wicket of Vanburn Holder ~ he was to play another test, but could not add to his kitty. The other debutant was Herbert Chang who played that Test only, was hit and left bleeding by a Karsan Ghavri bouncer to get hit wicket too. He went on a rebel tour to South Africa, promptly was banned; after lifting of ban in 1989, he could never hit the headlines. Media reports suggest that he was reduced extreme poverty and was seen standing listlessly on road.